The Whatman Mini-UniPrep Syringeless Filters provide a faster and easier way to remove particulates from samples being prepared for High-Performance Liquid Chromatography (HPLC) and Ultra High-Performance Liquid Chromatography (UHPLC) analysis. In fact, Mini-UniPrep lets you prepare samples in one-third the time required by other methods. Add up the time savings, plus the money saved from cutting multiple consumables out of the sample preparation process, and you will see a huge benefit for your laboratory. Protects samples from UV damage. Whatman Mini-UniPrep syringeless filters are preassembled filtration devices for the filtration and storage of laboratory samples. These devices are quick and easy to use and feature a plunger, filter and vial in one unit. They replace syringe-coupled filtration devices with single, disposable units. UniPrep devices consist of two parts: a test tube and a filter-plunger. The design incorporates a prefilter and a membrane into the tip of the plunger. When the filter plunger is pressed through the liquid placed in the test tube, positive pressure forces the filtrate up into the reservoir of the filter-plunger. UniPrep devices function in a similar way to the Mini-UniPrep. 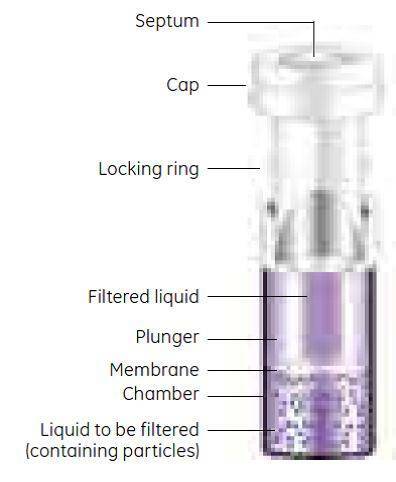 However, UniPrep does not contain a septum in the cap and can be used to filter larger volumes (1 to 5 ml). Whatman Mini-UniPrep™ Syringeless Filters provide a faster, easier way to remove particulates from samples being prepared for High Performance Liquid Chromatography (HPLC) analysis. Add up the time savings, plus the money saved from cutting multiple consumables out of the sample preparation process, and you’ll see huge benefits for your lab.